Here's a detail out of an oil by Jan Vermeer (Dutch, 1632 - 1675, which means the guy only made it to 43 and still produced so much amazing art). It's one of his most loved images, Girl with a Pearl Earring. I think it's fabulous. Below is an oil by Jean Michel Basquiat (American, 1960 - 1988). 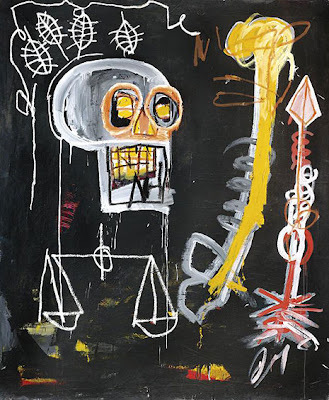 Long time readers of this blog probably know Basquiat is one of those painters I believe is seriously overrated. What's the difference between these two paintings that leads me to think so highly of Vermeer? Art and food have much in common. When I was young something that made a big impression on me were Christmas cookies. Other times of the year my mother would sometimes bake cookies, an activity I always approved of. While they always tasted good (and yes, the chocolate chip ones were the best) they weren't much to look at- modest little lumps of squashed down cookie dough. metal shapes into the soft dough. At age 6, this was high art! 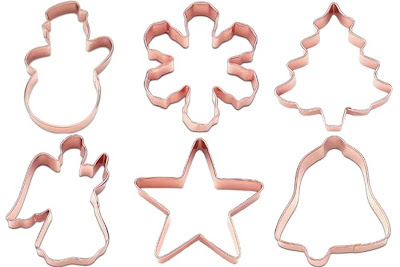 I used to conduct an endless internal debate about which of the shapes was the most beautiful- was it the angel, even though her wing had an obnoxious tendency to break off when it was time to remove the baked cookie from the cookie sheet, or was the more reliable bell shape or perhaps the serviceable Xmas tree? Looking back I realize this was probably the first time I was consciously evaluating silhouettes for their expressive potential. My six year old taste buds were convinced cutting out the cookies into these special shapes really did make the cookie batter bake into a tastier cookie. In this early simple way, the power of visual art had me in its sway. Look back up to the Vermeer and the Basquiat paintings above. Both have silhouettes of course. But Basquiat throws down a shape and leaves it just the way it came out on the first pass. It's purposely haphazard, a sort of self consciously casual attitude the artist hopes will say to us "I chose not to be careful, could have done it more precisely but I want you to notice how sloppy I was." There's sort of an adolescent defiance to it that perhaps appeals to some the first time they see his work. How long it will continue to intrigue us is more open to question (for me the intrigue was short lived). Vermeer drew and re-drew the outer contours of the woman's cheek, jaw and neck to get them just so. There's a coming together of a deeply intuitive and insightful artist caressing the forms into the most expressive possible arrangement. The carefulness, patience, and judgement all say to the viewer "this is exactly the way these forms need to be." To me Vermeer is claiming the visual high ground here. He's telling us that being alive is something special, and that at certain moments we can all grasp its significance. He's going to try his darndest to help us see how certain poses and lighting reveal meaning. I started talking about silhouettes by using the concrete example of cookie cutter shapes (and I bet as a kid Vermeer had some similar experience to mine in the kitchen). And paintings almost always begin with the artist considering her or his choice of flat shapes. They're building the foundation as if they're about to construct a house. Then they pour in their cooking ingredients into the carefully composed network of shapes. Vermeer would have had to grind his own pigments, a laborious and tedious process that did however give the artist an intimate knowledge of the paint- its exact intensity of hue, its viscosity, the fineness of its texture and so on. Like an expert chief painstakingly selecting their ingredients, the artist "pours" the color into the shapes, then slowly stirs and simmers the mix until the adjoining strokes of color meet up with their neighbors just right. Look at the two cheeks in the Vermeer- how beautifully he pushes the left cheek towards cooler greys and pulls the color in the right cheek closer to warm orange/yellow browns. The flow of color is so subtle you can't see where it is that cool turns into warm, but you feel the change. 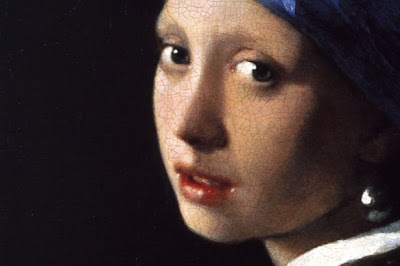 Look at the remarkable expressiveness of the woman's eyes, especially the prominence Vermeer gives to the whites of her eyes. To make that happen he had to push the highlights on her cheeks down to a light middle grey tone even in the cheek's lightest highlight. This is an artist who's eye could see many things at once and balance the various "flavors" off against each other. Vermeer shows us chords of colors instead on one color at a time. Basquiat in contrast paints the background black, stops, then picks up a tube of a red and plays with that and stops again. Then the white follows, and finally he splashes on a yellow. Fine tuning, adjusting, reconsidering all are out of place in this one-shot-and-we're-done world. It's immediate, but the aftertaste may leave one wanting. 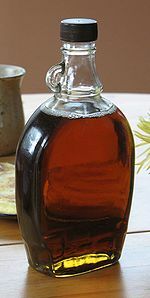 Back in my boyhood kitchen in addition to the Xmas cookies I used to love to eat pancakes with maple syrup (see below). Whether Vermeer ate such things I have no idea. But I remember my 6 year old tongue thinking the syrup tasted "really, really good." It's that sense of celebration I find in Vermeer's mysterious painting. In another life perhaps Vermeer and Basquiat became chiefs. Based on how they cooked up their paintings, I think I'll get a table over at Vermeer's Diner. I hear you can usually get a table at Basquiats' Bistro. Awesome post Phillip. I now want to go see a Vermeer and eat a pancake. Thank you! Thanks Jenn, I always like my art best with Maple Syrup! Aahhh, today was pancake day at our house. It was made better by enlarging the Vermeer. Then sitting back and enjoying all you wrote and the wonderfullness of his delicate yet expressive coloring. Thanks for adding to my day. Vermeer and pancakes- what's not to like? Basquiat and Vermeer's styles are completely opposite Basquiat is trying to portray the life and mindset of the ghetto and his people are painted crudely because thats what most people are,-crude. Basquiats have a meaning & a message. Vermeer is just painting things as they look. Of course they are painted in different techniques, they are different styles! They also have different meaning and goals.